The People's Assessors Law of the People's Republic of China has been adopted by the 2nd Session of the Standing Committee of the 13th National People's Congress on April 27, 2018, and is hereby promulgated to take effect on the day of promulgation. Article 1: This law is formulated so as to ensure citizens' lawful participation in trial activities, to promote judicial fairness, and to enhance public trust in the judiciary. Article 2: Citizens have the right and obligation to serve as people's assessors in accordance with law. The people's assessors are appointed in accordance with this Law, lawfully participate in trial activities in the people's courts, and have the same rights as judges except as otherwise provided for by law. Article 3: The people's assessors lawfully enjoy rights such as the right to participate in trial activities, to independently express opinions, and to receive safeguards in performing their duties. The people's assessors shall faithfully perform adjudicatory duties, safeguard adjudicatory secrets, observe judicial etiquette, and preserve the judicial image. Article 4: People's assessors lawfully participating in trial activities are protected by law. People's courts shall lawfully safeguard people's assessors' performance of adjudicatory duties. People's assessors' units and the basic-level mass autonomous organizations for the place of their household registration or habitual residence shall lawfully safeguard people's assessors' participation in trial activities. (4) Have the physical capacity to perform their duties normally. Those serving as people's assessors shall usually have a high school education or higher. (3) Other people unfit to serve as people's assessors due to occupational reasons. (5) Those who have been excused from duties as a people's assessor because of being subject to disciplinary actions. (6) Others who commit serious violations of law and discipline and may affect public trust in the judiciary. Article 8: On the basis of trial needs, the basic-level people's courts are request that the standing committee of the people's congress at the same level designate the number of people's assessors. The number of people's assessors is not to be less than three times the number of judges sitting in that court. Article 9: The judicial-administrative organs, together with basic-level people's courts and public security organs, are to randomly select five times or more the number of people that will be appointed as people's assessors to be candidates for people's assessors, conduct reviews of the people's assessor candidates qualifications, and solicit the candidates' opinions. Article 10: The judicial-administrative organs, together with basic-level people's courts, are to randomly select nominees for people's assessor from the list of people's assessor candidates who have passed qualification review, and the president of the basic-level people's court is to submit them to the standing committee of the people's congress at the same level for appointment. Article 11: As needed for trial activities, candidates for people's assessor may be produced through individual applications and recommendations from basic-level mass autonomous organizations or people's organizations for the site of their unit, household registration, or habitual residence; and upon a review of standing by the judicial-administrative organs, together with the basic-level people's courts and public security organs, select candidates for people's assessor, and have the presidents of basic-level people's courts request that the Standing Committee of the people's congress at that level make appointments. The people's assessors appointed in accordance with the provisions of the preceding paragraph must not exceed one-fifth of the number of people's assessors. Article 12: After being appointed by the standing committees of the people's congresses, people's assessors shall take a public oath of office. The oath-taking ceremonies are to be organized by basic-level people's courts together with the judicial-administrative organs. Article 13: People's assessors serve five-year terms and generally must not serve consecutive terms. Article 14: Where people's assessors and judges form collegial panels to hear cases, judges are to serve as the chief judge, and a three-member collegial panel may be formed, or a seven-member collegial panel may also be formed, composed of three judges and four people's assessors. (3) Where the case is complex or has other circumstances requiring people's assessors to participate in trials. Where the law provides for trial by a single judge or by a collegial panel composed of judges, people's courts' trials of cases provided for in the preceding paragraph are to follow those provisions. (4) other cases with a major social impact. Article 17: Where the defendants in first-instance criminal trials, the plaintiffs or the defendants in first-instance civil trials, or the plaintiffs in first-instance administrative trials apply to have people's assessors participate in the collegial panel for trial, the people's court may decide to have trial by a collegial panel composed of people's assessors and judges. Article 18: Apply the legal provisions on recusal of adjudicators for the recusal of people's assessors. Article 19: Where cases tried by basic level people's court need people's assessors to participate in the collegial panel for trial, they shall be randomly selected and designated from the list of people's assessors. Where cases tried by intermediate or high people's courts require people's assessors to participate in the collegial panel for trial , they shall be randomly selected and designated from the lists of people's assessors for the basic-level people's courts in the jurisdiction. Article 20: The chief judge shall perform obligations to direct and prompt as related to the trial of the case, but must not impede people's assessors‘ independent judgment on the case. Article 21: People's assessors participating in three-person collegial panels to hear cases are to independently express their views on the determination of facts and the application of law, and exercise voting rights. Article 22: People's assessors participating in seven-person collegial panels to hear cases, are to independently express their views and jointly vote with judges on the determination of facts; they may express views on the application of law, but are not to participate in voting. Article 23: Collegial panels deliberating cases are to carry out the principle of majority rule. Where people's assessors disagree with other members of the collegial panel, their opinions shall be recorded. Where there are major differences in the opinions of the collegial panel members, the people's assessors or judges may request that the collegial panel submit the case to the court president for a decision on whether or not to send the case to the adjudication committee for discussion and decision. Article 24: People's courts shall synthesize the actual conditions in their jurisdictional region to reasonably determine the maximum number of cases that each people's assessor will participate in annually, and make a public announcement. Article 25: The basic-level people's courts, together with the judicial-administrative organs, are responsible for routine management of people's assessors' work such as their training, performance evaluations, commendations and sanctioning. Conduct planned trainings for people's assessors. People's assessors shall participate in training as requested. Article 26: People's assessors who have notable achievements or have other outstanding deeds in trial work are to be commended and rewarded in accordance with the relevant provisions. Article 27: Where people's assessors have any of the following circumstances, upon confirmation and verification by a basic-level people's court, together with the judicial-administrative organ, the court president is to request that the standing committee of the people's congress at the same level remove the people's assessors from their positions. (4) Those violating laws or regulations relevant to trial work, twisting the law for personal gain, causing judgment errors or other serious consequences. Where people's assessors exhibit the conduct listed in items (3) or (4) of the preceding paragraph, they may be disciplined through methods such as notifying the unit they are in or the basic level mass autonomous organization or people's organization for their place of their household registration or habitual residence, and a public announcement in the area where they live, or by circulating public criticism; where a crime is constituted, criminal responsibility is to be pursued in accordance with law. Article 28: The safety of people's assessors' person and residence are protected by law. People's assessors and their close relatives must not be retaliated against by any unit or individual. Where people's assessors and their close relatives are retaliated against and framed, insulted or defamed, or violently encroached upon, legal responsibility is to be pursued in accordance with law. Article 29: People's assessors' units must not withhold or indirectly withhold their salary, bonuses, or other benefits for the period in which they participate in trial activities. Where people's assessors' units violate the provisions of the preceding paragraph, the basic-level people's courts shall promptly make a corrective opinion to the people's assessor's unit or the competent department for the unit. Article 30: For the period that people's assessors who do not have fixed income participate in trial activities, the people's courts are to follow relevant provisions to give allowances for the actual number of work days. Expenses such as for transportation and food that are incurred by people's assessors due to participation in trial activities, are to be compensated by the people's courts in accordance with relevant provisions. Article 31: People's assessors shall enjoy subsidies for participating in trial activities, and payments that the people's courts and judicial-administrative organs need to make for implementation of the people's assessor system are to be included in the people's courts and judicial-administrative organs' operational expenses, and have corresponding government finance assurances. Specific measures are to be formulated by the Supreme People's Court and the State Council department on judicial administration, together with the State Council department of finance. Article 32: This law come into force on the date of promulgation. 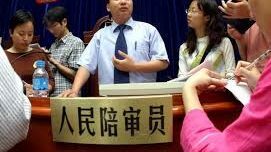 The "Decision of the Standing Committee of the National People's Congress on Improving the People's Assessor System", adopted by the 11th Session of the Standing Committee of the 10th National People's Congress on August 28, 2004, is simultaneously repealed. The estimated value for a full translation of this post is $216.66 USD at the below-market rate of $.06 per character, with 2,961 characters.